The tiny Klondike Gold Rush National Historical Park in Seattle's historic Pioneer Square neighborhood is posted with a closed sign as part of the federal government shutdown Wednesday, Dec. 26, 2018. One of my early jobs in the National Park Service was flying over the Mississippi River counting birds. I was required to take a “water ditching” class to learn how to survive a plane crash over water. What do you think the federal government recommends you do first to increase your chances of survival by 50 percent? That’s solid advice, advice I use whenever life feels like it’s about to crash — for example, when the federal government unexpectedly shuts down. This is my fourth government shutdown in my federal career. The first three we could see coming, and we had a clear idea of how long they would last. The 2013 shutdown was so obviously broadcast that my federal credit union sent out emails the week before, advertising “great rates” on short-term loans. Back then, I worked for government only part-time, and I nudged old editors and clients for writing gigs to fill out my lost income. 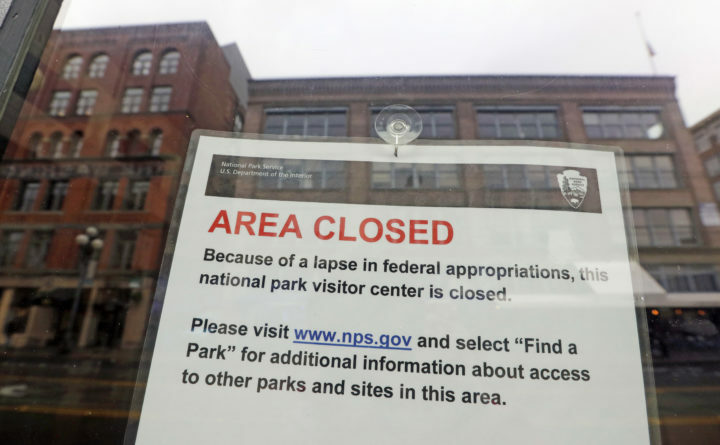 When I finally landed my dream of working full-time at the National Park Service, I knew I should always stash a paycheck or two in savings should a shutdown ever occur again. We laughed, saying he was behind the times. It all worked out; it wasn’t happening. The next day, shutdown preparations took precedence over any other work. I work Saturdays, so I would be one of the first staff members furloughed. I scanned news reports and texted D.C. friends who had Congress’ pulse, who confirmed there would not be any further votes. When I left work at 7 p.m. Friday, I knew the next day I would begin the shutdown dance. During a shutdown, you’re given four hours to get your affairs in order. You set your email to auto-reply; park social media, website and voice mail to the federally mandated script; and water your office plants. You lock up visitor facilities and place notices of the shutdown. I’m a planner. I make plans so I can be spontaneous. Not knowing how much or if any money is coming leads to panic attacks at 2 a.m. followed by rage knitting. My gainfully employed husband and I are lucky that we have savings and a geriatric house rabbit as our biggest responsibility. There are people worried about falling behind on their rent or mortgages. There are parents hoping their kids will hold off on having major growth spurts so they can put off purchasing bigger clothes. There are federal contractors who — regardless of whether Congress decides about paying federal employees — are effectively on forced unpaid leave. As tempting as it is to stay in my pajamas all day, feeling sorry for myself while nursing an Old Fashioned and bingeing “Gilmore Girls,” I can’t do that. I keep my alarm set to the same time. I get dressed, I get in my 10,000 steps and figure out what I can do that day, even if it’s confronting the urgent crisis posed by all my mismatched socks. I try to find ways to contribute to my household as a useful member of society, though my husband might have a different assessment: He doesn’t find my reorganization of household electronics remotely useful and is angry I “hid” his VGA adapter and decided he didn’t need his “dad jeans” anymore. My co-workers check in with each other by text, and on social media we share our methods for taming anxiety. For some it’s taking up breadmaking, or heading to the family cabin to find solace in nature. For others it’s putting together a challenging Lego gingerbread house set with their kids or attempting the insane art of diamond painting (which is like paint-by-number, but in 3D, using thousands of plastic beads, and in this case culminating in a portrait of Jeff Goldblum lounging in a field with dinosaurs). We put up a brave front about not obsessively checking the news or reading comments from people who think that we’re reveling in sloth. None of us took our jobs to get rich. We are public servants who love what we do. We are incredibly frustrated that we can’t do a fair day’s work for a fair day’s pay. Sharon Stiteler is a National Park Ranger for the Mississippi National River and Recreation Area. She writes as a private citizen and is the author of “Good Birders Still Don’t Wear White.” Her work can be found at birdchick.com.